Her time as the first woman to serve as Reveille’s handler will come to an end this week, but that’s not the end of Mia Miller's story. Mia Miller is the first woman in the history of the Corps of Cadets to serve as Reveille’s handler. One year ago, for perhaps the first time in the history of the Reveille tradition, there was more attention paid to the person holding the leash than Reveille herself. That’s because one year ago, Mia Miller became the first female member of the Texas A&M University Corps of Cadets to hold the prestigious tradition of mascot corporal. 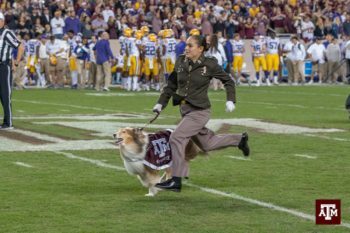 Miller’s historic year as the first woman to serve as Reveille’s primary caretaker in the Texas A&M University Corps of Cadets will come to an end this week at Family Weekend when she passes on her duties to the new mascot corporal in Company E-2, but her days as a leader and a visible campus figure are far from over. Long before Miller wanted to be Reveille’s handler, she wanted to be a Marine. In fact, becoming a member of the Corps of Cadets was an afterthought. Miller received a Marine Corps ROTC scholarship, and one of the core requirements was that she enroll at a university with an ROTC program. That limited her choices to Texas Tech University where her parents went to school, Rice University and Texas A&M. Although her parents were avid Raiders, family friends who were Aggies led her to enroll in Texas A&M. “I had no idea what the Corps of Cadets was until about a month or two before school started,” she said. It wasn’t until her military advisor recommended Company E-2, the Corps outfit tasked with caring for Reveille, the university mascot and the highest ranking member of the Corps of Cadets, that she jumped into Corps life with both feet. Miller and her fellow E-2 cadets were able to apply to be mascot corporal during the second semester of their freshman year. The audition process required weeks of studying the history of Reveille, practice speeches and essays. At the end of the audition process, Reveille’s handler is selected by fellow members of Company E-2, meaning she would have the full faith and trust of her peers to care for Reveille for a year. During Family Weekend in 2018, Miller was announced as Reveille IX’s handler for 2018-2019, making Corps of Cadets history by becoming the first woman to hold the position. Although the news made headlines around the state, the moment didn’t sink in until much later when she ran out onto Kyle Field for the first time. Miller begins every day at 5:15 a.m. when she gets out of bed to feed Reveille IX before heading out to the Quad and standing in formation with the rest of the Corps, with Miller, Reveille IX and Company E-2 at the head. Then, Miller and Reveille IX head to Duncan Dining hall for breakfast, and then a day of classes and the occasional meeting or event where their presence is requested. Being part of the Reveille tradition means taking time for Aggies to see Reveille IX and take pictures with her as she traverses campus. Miller said that as Reveille IX’s handler, she has to plan for an extra 20-30 minutes to get to each class because of all the attention. The constant starting, stopping, advance planning and adapting in response to the frequent photo opportunities changed Miller’s outlook on life. Miller’s time as Reveille IX’s handler wasn’t without its somber experiences. Last year, former mascot Reveille VIII, who served as the university’s mascot from 2008-2015, passed away at age 12. She was buried in Kyle Field Plaza alongside the seven previous Reveille mascots. Each of Reveille VIII’s previous handlers and scores of Aggies attended the funeral service. Between the photo opportunities and speaking engagements, Miller began to realize what it meant to be the first woman mascot corporal. But almost as soon as she realized the gravity of her position, her time as mascot corporal will come to an end. Despite the highs and lows that come with the responsibilities, she’ll miss her time with the First Lady of Aggieland, who, to the surprise of some, prefers a life of comfort. When Miller turns over Reveille IX’s leash to the next handler it will be the start of a new chapter, and not necessarily an end to one. Next year she will enter into Texas A&M’s nursing program and begin Marine officer training school soon after. In the Corps of Cadets she will serve as one of 10 sergeant majors. She will also continue to serve in Company E-2, which means she will stay in close proximity to Reveille IX until she graduates. After graduation, Miller aspires to serve as a nurse in the Marine Corps. Ramirez believes she is capable of that and more. But for now, one of the things weighing heavily on her mind is making the most of her final days with round-the-clock responsibility for Reveille IX. Knowing that there is a tried-and-true process in place to select the next handler gives her a sense of ease.